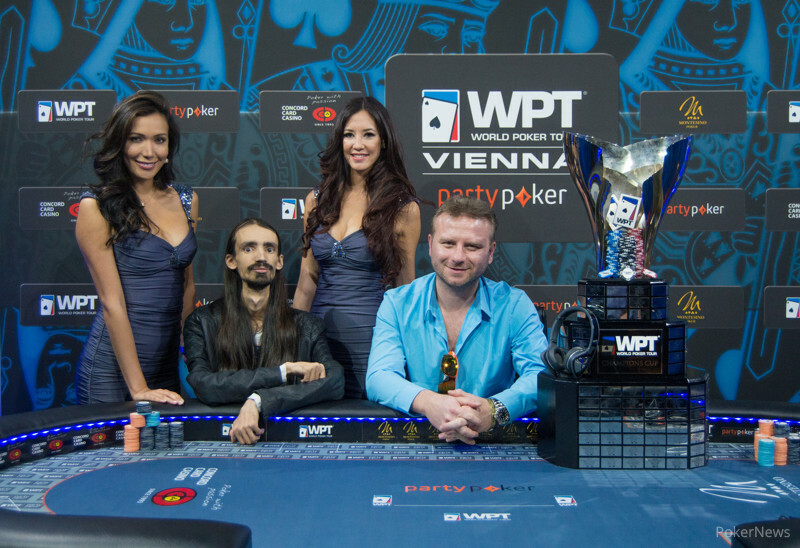 Konstantinos Nanos Wins WPT Vienna Main Event for €150,000! It took just 81 hands to get from six to a winner in the 2015 partypoker World Poker Tour Vienna Main Event. After five hours of play, Konstantinos Nanos came out on top, deafeating Vladimir Krastev to win the €150,000 first-place prize and a ticket for the WPT World Championship worth $15,400. The tournament started at the Montesino Vienna Card Casino at 1 p.m. local time with Krastev in the lead of a tough final table. It wouldn't be a good day for Sotirios Koutoupas. In the third hand of the day, he doubled up Thomas Bichon. Bichon flopped top two and turned a full house, and Koutoupas turned a flush. The two got it in on the river, and Koutoupas was crippled. Two hands later Koutoupas hit the rail. Gaëlle Baumann, presumably the first pregnant lady on a World Poker Tour final table in its long history, was to go next. She first doubled with ace-queen to ace-eight, but two hands later she found ace-ten suited in the small blind and four-bet shoved against Krastev. Krastev, who was the one who doubled Baumann moments ago, got his chips back when he called with ace-queen and flopped a queen. Baumann took home €35,500 for her fifth-place finish. Andreas Freund was eliminated on Hand #24 of the day, and again it was Krastev ending someone's tournament. Freund had first doubled up Bichon to find himself short stacked with king-nine in the small blind. He pushed and Krastev made the call with king-jack from the big blind. Both players hit their kicker on the fop, and the turn and river were blanks. Freund got €49,000 for fourth place. The biggest hand of the tournament happened not much later. Everything was going smoothly for Krastev, but a big misstep cost him a lot of chips. He raised from the button to 65,000, and Nanos three-bet to 175,000 from the big blind. Krastev almost instantly four-bet to 390,000. Nanos tanked for quite a bit before five-betting to 875,000 with about 1.6 million behind. Krastev took his time and eventually he announced, "All in." "Call," Nanos snapped, as he tabled the . 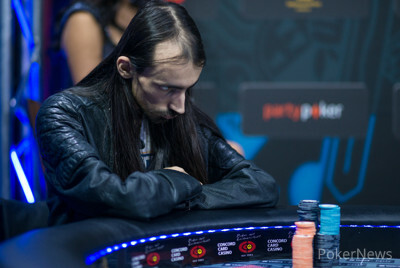 Krastev showed the , but he was in a lot of trouble in the pot that was worth over 75% of the chips in play. The board ran out , and Nanos' pair of aces held up. He celebrated loudly, kissed the WPT Champions trophy, and sat back down to receive 2.48 million chips from his opponent. Krastev was short from that moment on, but so was Bichon. Krastev doubled up and Bichon was looking to do the same, but the former WPT champion wouldn't succeed. He pushed with king-nine and got called by Krastev holding ace-eight. The board blanked out and Bichon left in third place, good for €65,000. When heads-up play began, Nanos had exactly twice the chips Krastev did. Krastev's momentum was gone ever since the big pot with king-queen against Nanos' aces, and he never got it back. During heads-up play, it was Nanos running the show and winning most of the pots. He worked Krastev down multiple times, but Krastev did manage to stay alive for a bit — sometimes going in with the best hand, other times with a small miracle on the river. In the end, Nanos got lucky to end it. In a single-raised pot, Nanos check-raised all in on the flop, and Krastev made the call. Nanos had the for a straight straight, and Krastev top pair, top kicker with the . The on the turn sealed it, and WPT Vienna had its champion. The on the river made things official, and Krastev finished runner-up for €103,000. *Nanos also received a $15,400 ticket for the WPT World Championship to be held at Borgata April 25-29. Next up for the PokerNews Live Reporting team is Malta for the European Poker Tour and Global Poker Masters. Coverage from the small country in the Mediterranean Sea starts Wednesday, so stay tuned! Hand 81: Vladimir Krastev raised it up to 125,000 and Konstantinos Nanos made the call from the big blind. The flop came and Nanos checked to Krastev. The Austrian responded with a continuation bet of 125,000. Konstantinos Nanos thought for a bit before shoving all in. Vladimir Krastev instantly called. Nanos had a pained face, knowing he was behind it seemed. It took some time before tournament director Christian Scalzi came on stage and asked both players to reveal their hands. 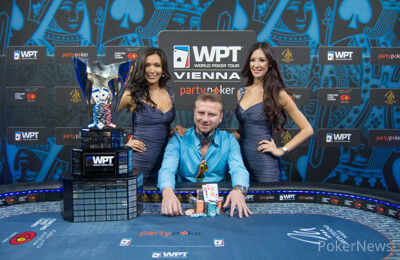 The on the turn settled it, the partypoker World Poker Tour Vienna Main Event had its champion! Both players didn't really seem to realize it just yet though, still staring at the board awaiting the dealer to bring a river. The made it official; Vladimir Krastev finished runner up and the title went to Konstantinos Nanos! Krastev received €103,000 while Nanos took home the €150,000 first place prize and the WPT World Championship ticket worth $15,400. Hand 78: Konstantinos Nanos limped in from the button and Vladimir Krastev shoved all in. Nanos thought for a bit before folding. Hand 79: Vladimir Krastev limped in from the button and Nanos checked his option. Both players checked the flop and turn. The river came the and Nanos checked. Krastev bet 125,000 and Nanos folded. Hand 80: Nanos opened his button for 100,000 and Krastev folded. 10 minutes of break for the players. Hand 73: Konstantinos Nanos opened for 90,000 from the button and Vladimir Krastev shoved all in from the big blind for 905,000. Nanos thought for some time, before folding. Hand 74: Vladimir Krastev limped in from the small blind and Nanos raised it up to 90,000. Krastev made the call. Nanos bet out 125,000 on and Krastev instantly folded. Hand 75: Nanos limped in from the button and Krastev checked the big blind. Both players checked the and the fell on the turn. Nanos bet 50,000 and Krastev instantly folded. Hand 76: Krastev limped in from the button and Nanos shoved all in. Krastev folded. Hand 77: Because a mistake was made, Krastev was once again the button. He folded and left the pot to Nanos. Hand 67: Konstantinos Nanos limped from the button and Vladimir Krastev raised to 120,000. Nanos folded. Hand 68: Krastev limped on the button and Nanos checked. The flop brought and Krastev bet 50,000, Nanos rised to 110,000 and Krastev folded. Hand 69: Nanos raised to 80,000 and Krastev called. The flop brought out and both players checked. The turn was the and Nanos bet 90,000, Krastev called. The river was the and both players checked. Krastev showed and he took down this pot. Hand 70: Nanos received a walk. Hand 71: Nanos limped on the button and Krastev checked. The flop brought and Krastev check-folded to a 100,000-chip bet. Hand 72: Krastev limped, Nanos moved all in and Krastev folded. Hand 62: Vladimir Krastev open shoved from the button for his last 605,000. Konstantinos Nanos made the call from the big blind. The flop was really good for Nanos: . After the hit the turn, Krastev was down to his last two outs. He needed to hit a four and a four only to stay alive and double up. Hand 55: Konstantin Nanos opened his button for 90,000 and Vladimir Krastev folded. Hand 56: Krastev opened for 100,000 from the button and Nanos made the call. The flop came and both players checked. The on the turn made Nanos check and Krastev bet 150,000, Nanos check raised to 390,000 and Krastev made the call. The fell on the river and Nanos bet 690,000. Krastev made the call. Nanos showed for a flush, Krastev mucked and was left with 650,000. Hand 57: Nanos opened for 90,000 and Krastev folded. Hand 58: Krastev folded, giving Nanos a walk in the big blind. Hand 59: Nanos raised to 90,000 and Krastev folded. Hand 60: Walk for Nanos again. Hand 61: Nanos limped on the button, Krastev shoved, Nanos folded. Who's Hungry for a WPT Title?